Sweet and tangy with just a hint of spice, super colorful, and perfect for a cool dinner or lunches all week. American Family Insurance is inspiring all of us to #ChooseDreams, and that means sitting down not only to #SundaySupper with our families, but also throughout the week. 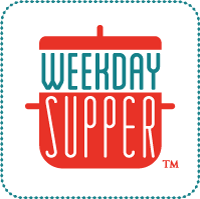 So we are also bringing you a month of #WeekdaySupper Family Favorites Turned Healthy. 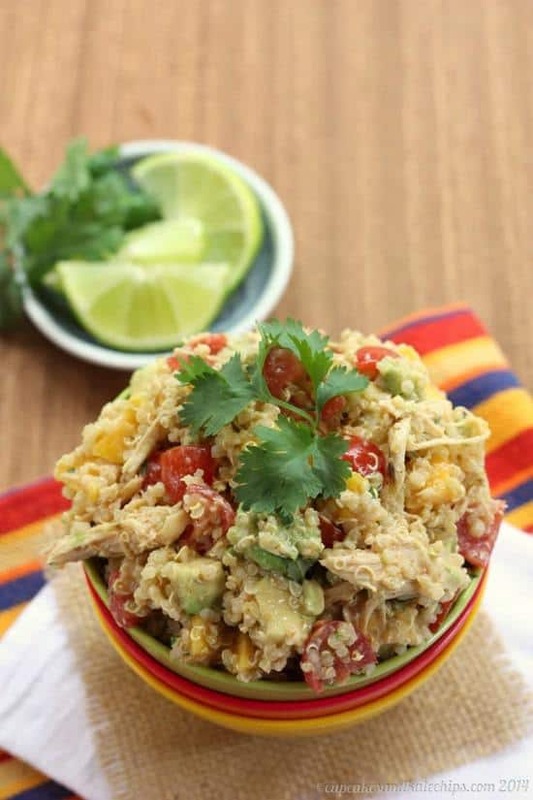 For a cool dinner or lunches all week, make a big batch of rich and healthy, sweet and tangy with just a hint of spice, super colorful Mango Avocado Quinoa Chicken Salad. I know I’ve mentioned many times that I am so lucky that my kids are very good eaters. I think I mention it so much because it truly shocks me. I mean, I know I present them with a wide variety of foods, and have since the day they first started solid food, so all of these things are just normal, everyday components of our regular diets. It’s not “weird” or “healthy” in their minds. It’s just “food”. But The Hubby and I both grew up pretty much despising any fruit or vegetable that was not white or yellow, and eating many casseroles involving packaged stuffing and cream of mushroom soup. And lots and lots of cookies. Luckily we have changed our ways as adults, and enjoy a much wider variety. But there are a few things that I’ve struggled to get my family to eat. One of them is quinoa. I love it, and it is so good for you. Packed with protein, a whole grain, and gluten free, which is awesome for my wheat allergy. I mean, nutrition-wise, what more could you want? But The Hubby has never been a fan of the texture, and the boys, well, I’m not sure what their issue is, but they don’t dig it. However, I refused to give up. So I’ve cheese-ified it, which works OK. I’ve granola-fied it (with chocolate), which is super yummy, but not really the “normal” way to eat quinoa. Finally I tried chilling it, to change the texture slightly, adding some chicken for my meat-loving hubby, and combing it with other favorite foods, and it was a total win! I was soooo shocked and excited when all of my boys just absolutely devoured Strawberry Lime Quinoa Chicken Salad. So naturally once you find something that works, just make it over and over and over again in slightly different variations, right? 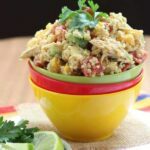 Mango Avocado Salsa has been a family favorite for a few years, so I combined that with the quinoa chicken salad, and we had another quinoa success story! Well, I’ll call it a 95% success. The Bug required complete tomato removal because there is absolutely nothing I can do to get him to eat anything tomato other than ketchup and pizza. But Little King Stuff was happy to polish off The Bug’s share of tomatoes. I love quinoa, I love chicken salad, but I really love combining the two. 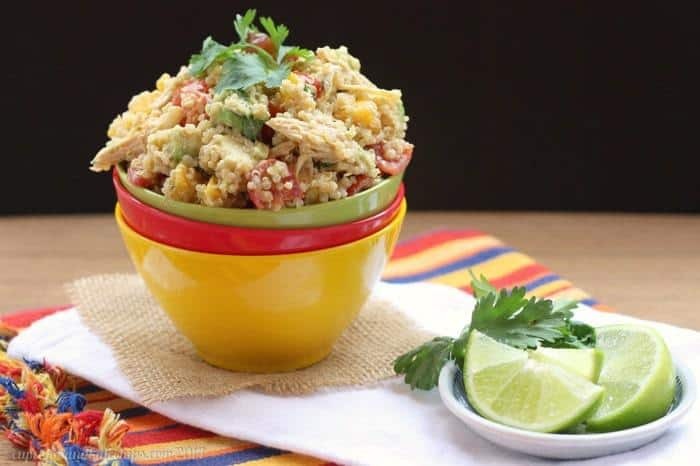 The quinoa adds such an interesting texture to the chicken salad, and tossing in all of the components of the salsa recipe brings in the rich creaminess of the avocado, the sweetness of the mango, the juicy pop of tomatoes, and a bit of tang and a just a hint of spice. I wouldn’t even call it spice. Warmth, maybe? And the colors just can’t be beat. Gorgeous, right? And so tasty, too! American Family Insurance not only wants to inspire everyone to #ChooseDreams, they also want to help you pursue those dreams. Throughout their social media communities, they will be providing tips and tools, inspiration, statistics and encouragement for dreamers on various topics, and encouraging you to share your stories as we grow this community of dreamers. That is where Sunday Supper (and Weekday Supper) comes in. Together with American Family, we are giving you recipes for Family Favorites Turned Healthy, whether this means making traditional comfort foods healthier, sneaking in some extra veggies, giving the kids healthy snacks, or accommodating different food allergies. So I hope you’ll try this and many of the other nutritious and delicious recipes on the Family Favorite Recipes #ChooseDreams Pinterest board. We will be pinning lots of amazing Sunday Supper and Weekday Supper recipes, from appetizers and salads to main dishes and desserts, all summer long! Follow along with American Family on Linkedin, Youtube, Google+, Twitter, Facebook, and Pinterest, and #ChooseDreams! And make sure you check out all of this week’s Family Favorites Turned Healthy at the bottom of this post. How have you gotten your family to eat something they previously didn’t like? 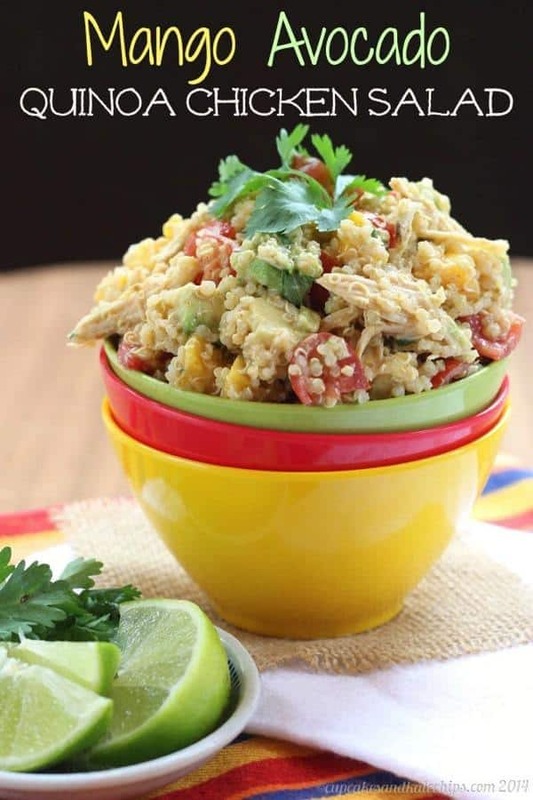 Combine the quinoa, chicken, and dressing in a large bowl and toss to coat evenly. Add the mango, avocado, tomatoes and cilantro, and toss to combine. Add salt and pepper, to taste. Serve over salad greens with additional Honey Lime Chili Cumin Dressing, if desired. Combine all of the ingredients in a bowl or jar and whisk or cover and shake. Adjust seasoning with salt and pepper to taste. So far no one has mentioned that they have made this. That is a pet peeve of mine on blogs. Anyhoooo, I made it tonight to serve tomorrow for lunch for some ladies. I made it ahead with all ingredients except the avocados. I will add the avocado right before we eat. Holy cow cupcake lady, this is truly amazing. I just love the flavor blend of the dressing. I was skeptical because I don’t like a lot of chili powder and it seemed a lot. I did cut it to 3/4 teaspoon but not next time. Thanks so much for such a creative dish. I can’t wait to eat it for lunch tomorrow. I wonder what else I can use that dressing for. It is a quick recipe especially if you have precooked chicken in the freezer. I cook the chicken breasts in the crock pot, shred and freeze in 1 cup servings. I accidentally bought whole milk plain yogurt from trader joes. I wonder if it will be that much different to use fat free plain. I can’t wait to browse your other recipes. Thanks for the great feedback and so glad you liked it! 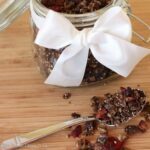 My blogger friends and I have been chatting recently about how few comments are from people who make our recipes, but we LOVE the feedback, good and bad! This would make such a great lunch option. I love the addition of mangos! It is a fabulous lunch! 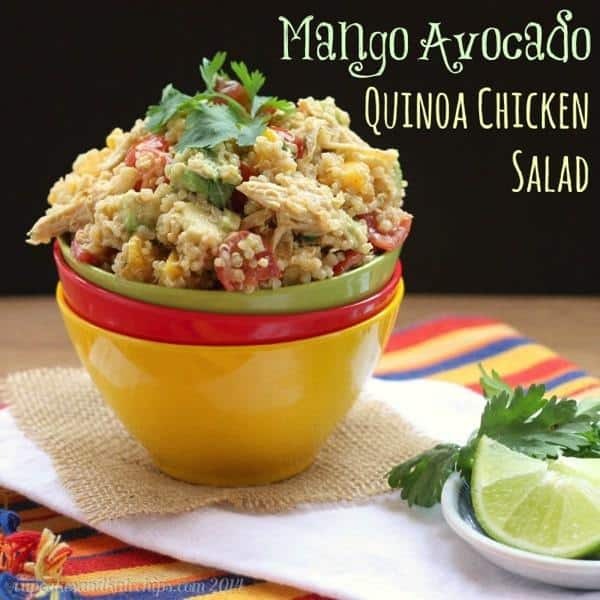 Mango pairs so well with avocado! Hi! I want to make this recipe this week and I don’t have a lot of experience with quinoa. When you say “2 cups cooked and cooled quinoa (previously prepared as per package instructions),” do you mean measure out two cups and cook the quinoa? Or after you cooked it, you should have two cups total? Is there a difference – I’m not sure if it’s like other grains that double in size when cooked. Thanks! Yes, but leftover cooked quinoa stores well in the fridge and is great on top of salad, in fruit and yogurt parfaits, etc.! Yum! I love this! I am always looking for guest bloggers on my website Blissful and Domestic. My blog is about creating a beautiful life on less and this post fits right in with that 🙂 Check out my blog and see if it would be a good fit for you. I’d love to have you! Mango’s are one of my favorites and will have to try this- thanks for sharing. Such a nice combo of healthy ingredients! This looks amazing, definitely going to be trying it! I have the same problem, can’t convince the family that quinoa is good. Maybe this one will win them over! This looks delicious Brianne. I’m always looking for new ways to have Quinoa. Thanks for sharing! What a wonderful salad! It is so perfect for summer too with the mango. Thanks Renee. We have been eating lots of mangoes! 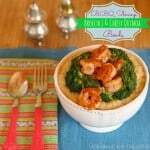 I love healthy recipes like this during the crazy and insane work week to just sit down with the kids to eat dinner! It’s so important to eat healthy with the family. I always tell myself during the summer month, okay, I’m gonna loose this weight this summer, be active but you know, summer is harder to lose weight than the rest of the year because you’re constantly being tempted to eat junk! It’s constantly in front of you. So when you are home, I guess choosing healthy family friendly recipes like this is just so vital!!! I agree, I think it’s harder for me in the summer too. I LOVE ice cream. But I try to balance it with healthy choices! I love all of the fresh flavors in this salad. Quinoa is one of our family favorites! Thanks Lisa! 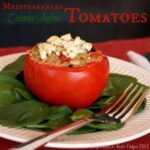 It is a great combo of hearty and fresh. This dish is PERFECT! Quinoa is runner fuel! It’s packed with protein and lots of fiber. 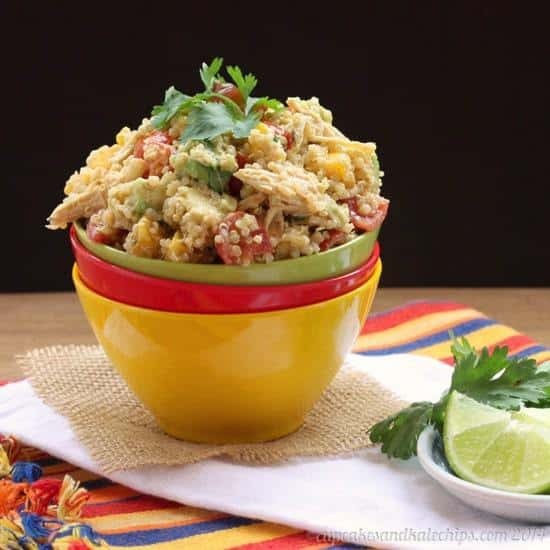 The avocado adds good fats runners need and a bit of chicken offers additional protein. I love the mango twist! and that honey cumin lime dressing sounds DELISH! Perfection in a bowl, I say! Yes, it truly is an energizing recipe. And vegetarians could totally leave out the chicken, but adding it makes quinoa more palatable to my hubby.